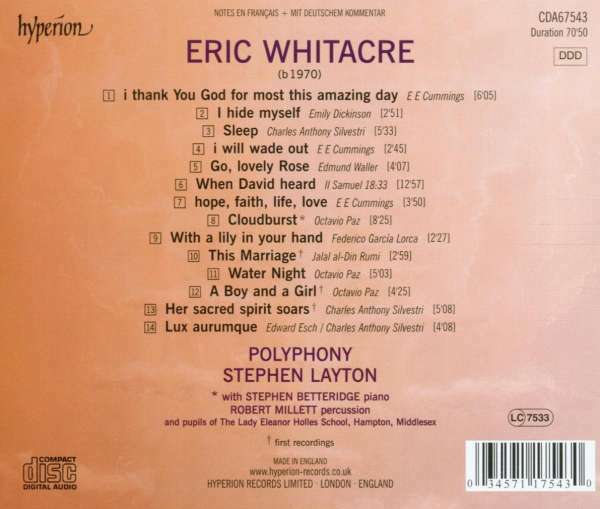 Der Artikel Eric Whitacre (geb. 1970): Cloudburst wurde in den Warenkorb gelegt. At the age of only 35, Eric Whitacre has already gained a reputation in the United States that many composers strive for a lifetime to achieve. The American Record Guide named his first recording one of the top ten classical albums in 1997, and the Los Angeles Times described his music as having ‘electric, chilling harmonies; works of unearthly beauty and imagination’. His Water Night (included on this new recording) has become one of the most popular choral works of the last decade, and is one of the top-selling choral publications of all time. Whitacre’s published works have sold well over 350, 000 copies worldwide. This is clearly a composer to watch, and if his phenomenal Stateside success is anything to go by, his emergence into the British music scene should be revelatory. And who better to represent an innovative young choral composer than Stephen Layton and Polyphony, award-winning exponents of twentieth-century choral music? Their account of Britten’s Sacred and Profane garnered the group a Gramophone Award and a Diapason d’Or in 2001, in 2002 a Gramophone Award nomination followed for the choir’s Walton CD, and at the 2004 Gramophone Awards Polyphony’s recording of works by Arvo Pärt, Triodion, was voted Best of Category in the Choral division. 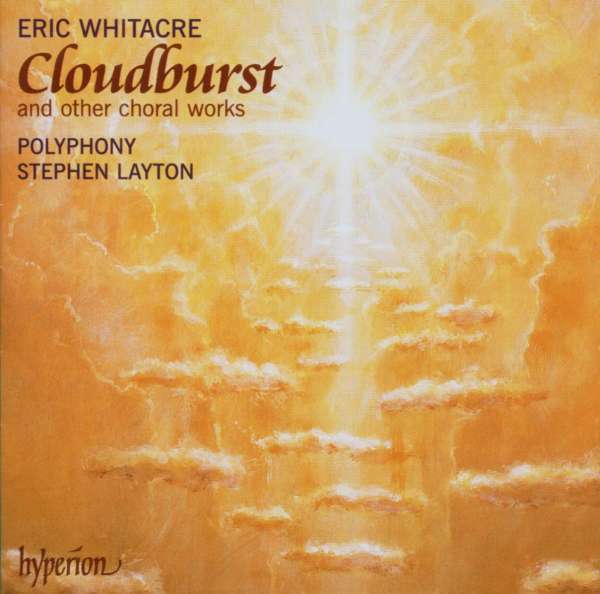 Under Layton’s directorship, Polyphony handles Whitacre’s evocative and soulful music with consummate artistry; from the quiet intensity of Sleep to the breathtaking exuberance of With a lily in your hand, by way of the tender innocence of This Marriage (one of three premiere recordings on the disc), this new recording is a stunning showcase both for an up-and-coming young composer and also for the awesome talents of one of the UK’s leading choirs. M. Stäbler in FonoForum 05 / 07: "Gestrenge Neue-Musik- Puristen haben für Whitacre naturgemäß kaum mehr als ein Naserümpfen übrig; doch vermag seine Musik wenigstens teilweise faszinierende Sogkraft zu entfalten - zumal, wenn sie so klangschön und kompakt gesungen wird wie in der Aufnahme des Ensembles Polyphony unter seinem Gründer und Leiter Stephen Layton mit zahlreichen Ersteinspielungen."